I just finished downloading the free upgrade; took about 3 hours. Looks purty, will test things out for the next few hours to get a better indication of what it does and how I like it. i reserved it but still haven't received the notification. there's actually a site where you can download the upgrade install yourself if you don't want to wait..
haven't tried it yet. want to make a full system image backup beforehand just in case but had problems with that this morning. will try again now that it seems the backup is mysteriously working again. I'm having some sound issues after installing Win 10.When i play YT clips and music from my media players i get some skips and dropouts and the occasional short burst of buzzing. I tell you, evil forces are at work. If I upgrade it will be from a windows 7 machine. Couple of dumb questions; Im guessing not every screen can be a touch screen,so my non touch screen will stay non touch even after upgrading? If so, which I think it would be, then I'de be interested in comments from upgraders in my position or in general, how essential is a touch screen to productive,enjoyable use of windows 10? How is the experience on a non touch machine after upgrading? Worth it? If you don't have a touch-screen monitor, upgrading to Windows 10 won't change that. From things that I've read, if you have Windows 7, it's recommended that you wait to upgrade (presumably to wait for bug fixes?). If you have Windows 8 or 8.1, it's recommended that you upgrade. But I'd read as much as you can about it before you do anything. i just upgraded (with the downloaded install) from 8.1 and the only problem i had was the sound didn't work right away. that was easily fixed though by upgrading the drivers on my sound device. still playing with it so other things might pop up but so far so good. interesting sidenote - if you had Avast or some other 3rd party anti-virus installed at the time of the update, it will be gone in 10. Windows Defender takes over completely - at least for me it did. fine with me though since removing McAfee from 8.1 left some crap behind that prevented Defender from running. I have Windows 7 on my laptop and XP on my old desktop. I took the download on the laptop, but I'm apprehensive about actually installing it because of the likely issues that I might see (along the lines of what UnevenStephen wrote about). After having Windows 7 for years, it was only just this week that I figured out how to get my old (but still perfectly functional) printer working in a way that didn't involve VNCing to my XP desktop. The manufacturer doesn't have any supported Windows 7 drivers, but I was able to use it directly over the network attached to my XP desktop by lying to Windows 7 about what kind of printer it is and customizing the port properties. I'm leery about going to Windows 10 and having to jump through the same kinds of hoops with all of my other hardware gizmos, doo-dads and what-nots. All so that I can use an increasingly annoying UI. Got it set up on my laptop on Wednesday. 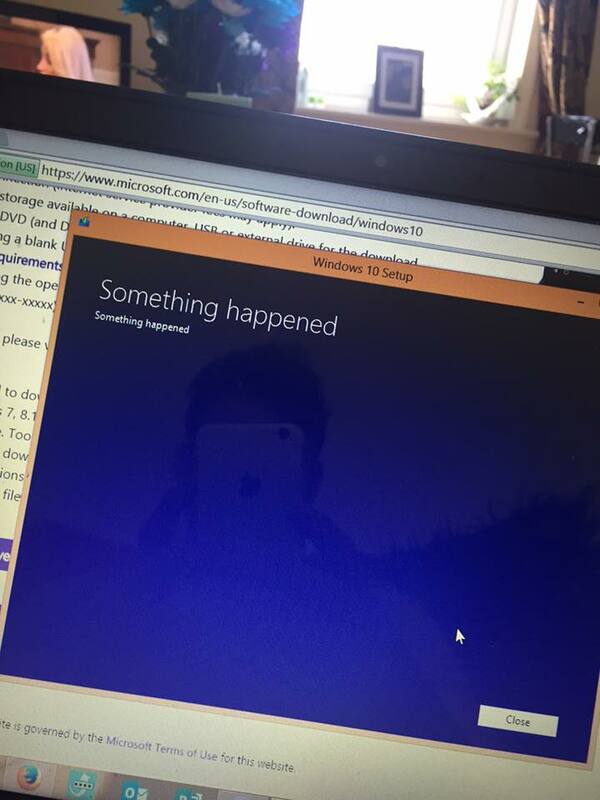 Hit an error when the laptop decided it needed to be charged. I restarted the download and it got everything set up in a couple hours, rebooting itself when it needed to. Piece of cake. 10 looks better than 8.1 did, with less annoyances. Warning, if you had Windows Media Center it will wipe it away and it's not coming back. Too bad because that was a pretty good multimedia system, better than Plex. I have yet to try it but the new browser is considerably faster and less bloated than Chrome has become. I think I read that Internet Explorer is going away, too. What does 10 use as a media player, then? for those who got the download notification via Windows Update, what did you do - if anything - for a product key ( XXXXX-XXXXX-XXXXX-XXXXX )? was one given to you? and what about an install disc? were you prompted to download an iso file? i have the iso/install already burned but if i ever have to reinstall/repair from this disc and it asks me for a product key, i won't know what to put. IE was actually replaced by Edge. it's still a browser but it has different name and look.. looks like the media player has to be downloaded from the Windows store. Windows Media Player is still available. It's Windows Media Center, the app that plays movies and can draw from an external drive, is the one that's toast. Edit: a lot of sites like Lifehacker are offering a lot of tips on how to get the most out of 10. Last edited by Jerjo; 07-31-2015 at 12:30 PM. From things that I've read, if you have Windows 7, it's recommended that you wait to upgrade (presumably to wait for bug fixes?). Edge seems to be fast. There is also a link on the Windows startup icon that can connect you to IE. Edge also allows ones favorites to be transferred from other browsers; Chrome, IE etc. Edge does not support Java so any sights needing it will have to be connected via IE or similar. Also, when I try d/ling from Big O, only opened up and played the track, no save option so had to use IE. There is a voice command prompt center that seems to be pretty cool. Similar to the one on my phone. lt also has some issues identifying certain words/phrase. One feature of Windows 10 that sounds pretty dumb to me is that if you friend someone on Facebook or similar social media, Windows 10 will automatically log them into your wifi without prompting for a password. While this sounds great in that you don't have to give anyone your wifi password, it really amounts to a huge security hole. Someone could friend you, drive by your house and have access to your wifi. The feature defaults to being on but you can shut it off if you are aware enough to do so. Yet another instance of Microsoft thinking they know better than the rest of us and try to force us into what they want. Me, I'm happy enough with Windows 7. I've tried out 8 and found 7 to be more usable Of course I'm a Linux user so nothing Microsoft releases will ever thrill me. Of course, going by the trope that every odd numbered release of Windows works, they've shot themselves in the foot on this one. I still have a laptop with Windows XP and I hope it will work for a long time, because there is no update for the driver for my Akai Z4 sampler, so it's the only computer I can use to load sounds and do other things with it. Yes, I could do everything from the frontpanel, but it doesn't handle easy, besides, it sits pretty low in a 19" rack. If Edge does not support Java, it will be useless in Denmark. If you want to communicate with your bank, tax authorities, want a new passport, insurance, etc., Java is required, no way around it. Well, there are lots of great browsers out there and IE was the worst, so... but it looks like a Microsoft bummer, unless they make a special Danish version of Edge. In my house I have machines with XP, 7 and 8.1. - they all have their advantages. At work there is one with Vista - it has lots of annoyances. now that i've been using 10 for a few days, i noticed one other big plus - it's much faster than 8.1. at least on my machine. before just bringing up a context menu with the right mouse button would take forever. Chrome was a real pig both on startup and shutdown and there were a few other apps that either hung while in use or took forever to shut down. all that seems to have gone away. liking 10 more and more each day.